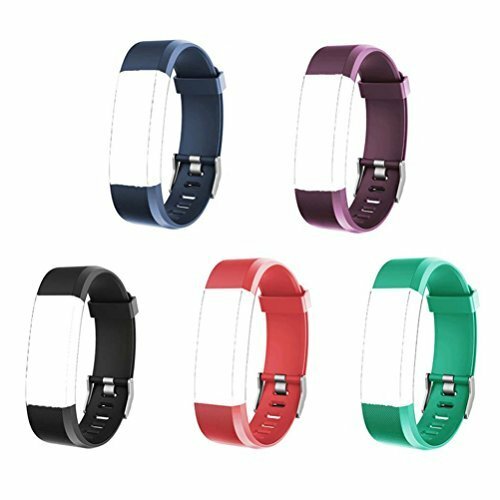 5 colors replacement bands ONLY for ID115Plus HR. 【Compatibility】 This replacement wristband is designed ONLY for ID115HR Plus fitness tracker, it CAN NOT be used on ID115 or ID115HR or ID115U fitness trackers etc. 【High Quality TPE Material】 Durable and soft silicone guarantee you a comfortable wearing experience when doing sport, working or outdoor. 【Adjustable Design】 Adjustable strap fit wrist size from 149mm(5.9 inch) min to 220mm(8.2 inch) max. 【Easy to Use】 Just connect this replacement straps with your fitness tracker by yourself, no tools needed. Share the fun of assembling something. 【Mutil Colors】 Five colors in one package. The classic colors can meet nearly all your need for differenct mood and different occasions in your daily life and work. If you have any questions about this product by Seetwo, contact us by completing and submitting the form below. If you are looking for a specif part number, please include it with your message.